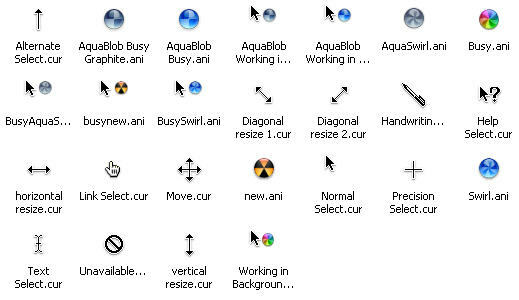 Here are total 25 original Mac OS X cursors, converted for using in Windows 7, Windows Vista and Windows XP. All the cursors are with alpha blended transparency which makes the cursors as good looking as on Apple's Mac OS X. The zip files has been attached here as a mirror for Winmatrix members. Update: You can now download Mac OS X cursor for Windows with .INF installation files. No need to select and apply the cursors one-by-one, just right click on the .INF file and select "Install". If you like these cursors then you would also like Windows 7 cursors for Windows XP. now, a question that is NOT a rant, ok? what is the deal with people (namely non-americans) using RAR? for such a small set of files, why not zip? walla... thanks dude, U have just ans. my Qs. ths is what i am looking for..
ok, cool, that i can understand. Thanks for the whole set. Wow! Excellent Mac cursors! I compared them with my geniune mac cursors in my powerbook; and they identical! I really like these cursors. oh dude JUST WHAT IM LOOKING FOR MAN. i can FINALLY complete my offical Mac Os X theme. thanks A LOT!